Agathe Jacquillat (French, born 1975) and Tomi Vollauschek (Austrian, born 1973) of FL@33 (UK, est. 2001) Bzzzpeek.com. 2002. HTML and Flash software. 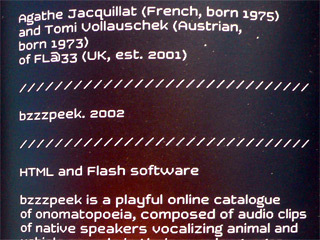 Bzzzpeek is a playful online catalogue of onomatopoeia, composed of audio clips of native speakers vocalizing animal and vehicle sounds in their own languages. 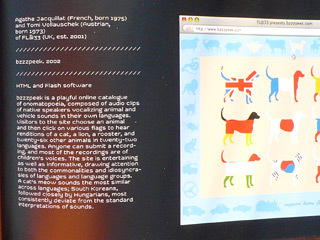 Visitors to the site choose an animal and then click on various flags to hear renditions of a cat, a lion, a rooster, and twenty-six other animals in twenty-two languages. Anyone can submit a recording, and most of the recordings are of children voices. The site is entertaining as well as informative, drawing attention to both the commonalities and idiosyncrasies of languages and language groups. 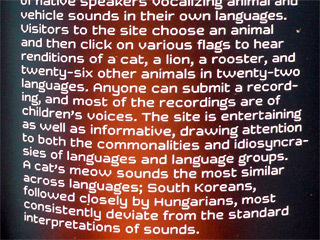 A cat's meow sounds the most similar across languages; South Koreans, followed closely by Hungarians, most consistently deviate from the standard interpretations of sounds. In this world of constant and ubiquitous communication, ignorance is not considered to be bliss, and misunderstandings are dangerous missed opportunities – except when they are integrated in a script as moments of shock and revelation, as interesting double entendres. Still, mishaps they are, and in common parlance they are conversation, even communication stoppers. ...true tolerance are why so mang people have devoted their lives to helping us understand others, or at least whomever our local cultural conventions consider "others." History has prepared us for this moment with centuries of war, activism, and progress, however slow, in banishing taboos and embracing diversity. All the important twentieth-century movements of emancipation, equality, and liberation have proceeded in this direction. We also know that we still have a long way to go. ___ This is why designers, whose focus is alwags centered on improving conditions for human beings, have become engaged in projects that require not only the classical elements of design education but also basic tenets of cognitive science. In previous chapters we have explored how the Internet and wireless networks have created new layers of complexity and possibility in human communication. Designers are now taking on the communication issues these layers have presented, issues now central to our daily activities: negotiations of privacy and anonymity; the vehemence and violence abetted by the ability to hide behind false identities; the promise of new and unregulated means of expressions, connectivity, and revenue generation, and the responsibilities that go with them. ___ By focusing on those issues, often with actionable proposals and sometimes with visionary clarity, designers have joined with abandon the ranks of those encouraging cross-cultural understanding. 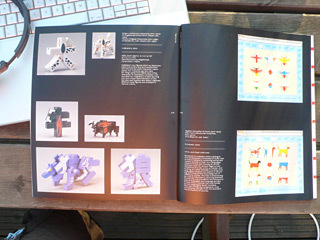 This chapter contains design solutions for curious humans who want to experience what it feels like to be something or somebody else, whether a bat (page 176), a crow (page 177), a menstruating woman (page 182), a person uvith a disability (pages 190–92), and other kinds of transformers and outliers. The activist efforts of some designers, whose decisive metaphors and statements have the blunt force of manifestos, work toward these simple goals: if not acceptance, at least tolerance; curiosity rather than rejection; a better, more fulfilling, more organic, more just way of living together. P. A. 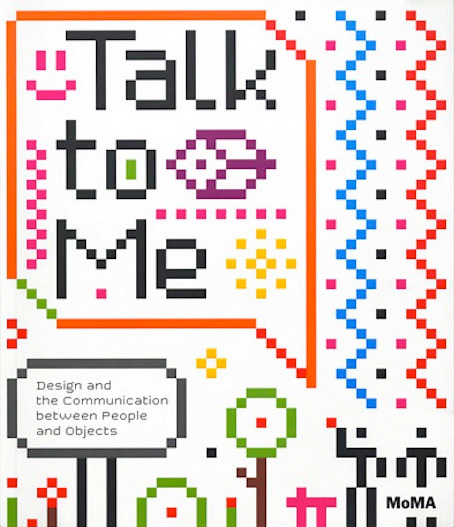 Published in conjunction with an exhibition at The Museum of Modern Art, Talk to Me thrives on an important late 20th-century cultural development in design: a shift from the centrality of function to that of meaning. From this new perspective, objects contain information that goes well beyond their immediate use or appearance, providing access to complex systems and networks and acting as gateways and interpreters. Whether openly and actively, or in subtle, subliminal ways, things talk to us, and designers write the initial script that lets us develop and improvise the dialogue. Talk to Me focuses on objects that involve direct interaction, such as interfaces, information systems, communication devices, and projects that establish a practical, emotional or even sensual connection between their users and entities such as cities, companies, governmental institutions, as well as other people. The featured objects range in date from the early 1980s beginning with the first Graphic User Interface, developed by Xerox Parc in 1981 with particular attention given to projects from the last five years and to several ones currently in development. Included are a diverse array of examples, from computer and machine interfaces to websites, video games, devices and tools, and installations. Organized thematically, Talk to Me features essays by Paola Antonelli, Jamer Hunt, Alexandra Midel, Kevin Slavin, and Koi Vinh. By introducing design practices that are becoming increasingly crucial to our world, the book presents a highly distilled sample of todays best design production that uses technology in creative and unexpected ways, showing how rich and deep designs influence will be on our future.